This entry was posted on Thursday, February 7th, 2019 at 6:28 pm. 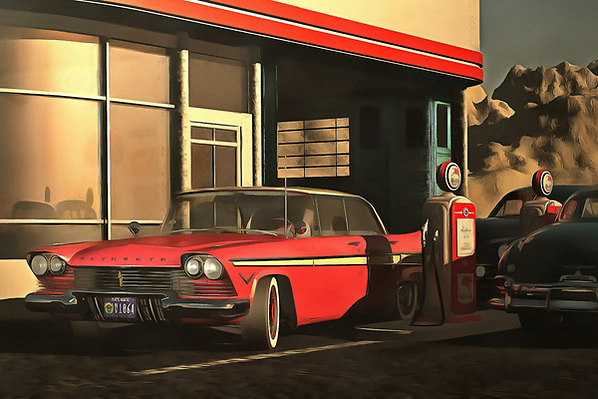 It is filed under Auto / Cars, Conceptual, HOMEPAGE MAIN PICTURES, Ideas and tagged with acrylic, American, belvedere, car, cars, fifties, gas, gasstation, jan, Jan Keteleer, keteleer, oil, oil painting, old, old timer, old-timers, oldtimer, oldtimers, painting, photorealistic, plymouth, red, sedan, the fifties, U.S.A., United States, USA, veteran. You can follow any responses to this entry through the RSS 2.0 feed.